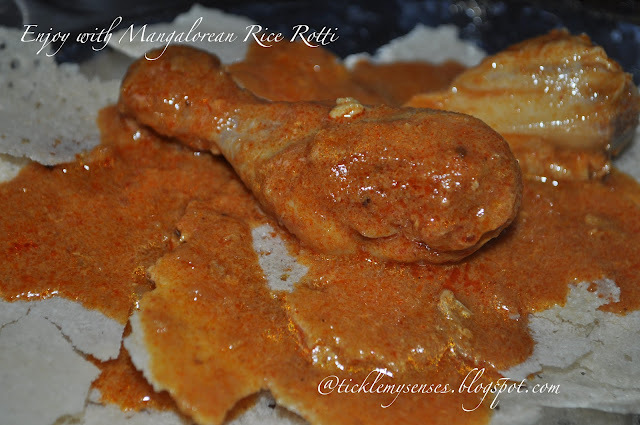 Tickle My Senses: Mangalore Chicken Curry with Roce/ Coconut Milk (Kori Ghass/ Kori-Roti) and a Mom's triumphant moment. Mangalore Chicken Curry with Roce/ Coconut Milk (Kori Ghass/ Kori-Roti) and a Mom's triumphant moment. I am one helluva proud and hormonal mom who has just managed to complete a 17 month long wonderful nursing journey with Baby A. A journey at the beginning that seemed impossible and scary, but came so naturally, was all consuming, with precious moments of bonding, periods of frustration and periods where I was on the verge of giving up completely. Today I am content with the fact that I gave it my all, persevered in the most trying periods, and have given Baby A the best possible start in life. The positives have been many but the highlight has been a sleeping and peaceful baby on every one of the 12 flights weve taken across 6 countries since he was born. The lowlights have been few and mainly during periods of teething and him being poorly. I must admit though, the weaning part has haunted me the most. Because Baby A was fed on demand since birth, I was afraid he wouldnt be a happy bunny without his comforter, soother and favourite drink. Spent sleepless nights wondering how to wean him whether to use neem oil, bittergourd juice, bitter aloe, did a lot of research and then finally decided to try the most easiest option.....A BOX OF PLASTERS.....you read that right..if only I knew that plasters would work like a charm I wouldn't driven myself mad with worry. Anyways I wholly recommend plasters to any mom with thoughts of weaning their baby. Baby A didnt shed a tear and has taken it quite well ...unlike myself, with my hormones all over the place at the moment. For the last few days I've had the urge to eat a hot and spicy coconut chicken curry, without the hassle of having to fuss over it. I have already posted a tasty and elaborate recipe for traditional Kori Ghassi / Kori Rotti, which is okay for those who have the time. But for those impatient ones like myself at the moment, wanting quick and tasty results.....this one wont let you down. This is a very simple recipe, using the basic cupboard essential spice powders and ingredients. It is express, hot, flavourful and will probably take you only 7 minutes from start until you drop the chicken in for cooking. As I used baby chickens here the chicken cooked within 10-15 minutes max on a medium flame. Once you taste it I guarantee you will make it again and again. A must for this express recipe is a can of coconut milk, ready browned onions available in most Asian stores or even Tesco in the UK. I also had the butcher deskin and chop the chicken up to curry size pieces, so I only spent time putting things together. Garlic: 5 large flakes, chopped. 1. In a deep vessel pour a tbsp of oil add sliced garlic and fry till lightly brown. Add the ready browned onions and warm gently through. Take the vessel off the fire and add all the spice powders, fry gently for a few seconds till aromatic. Put the mixture into a small grinder add a 1/4 can of coconut milk, tamarind paste, and blitz for 30-60 seconds till a thick paste is formed. 2. Return the ground mixture to the same vessel, empty the coconut milk can, add 1/2 a cup of ready browned onions, a cup of water. Bring the mixture to boil, taste for salt, add the chicken. Close the lid and cook on medium heat till done. 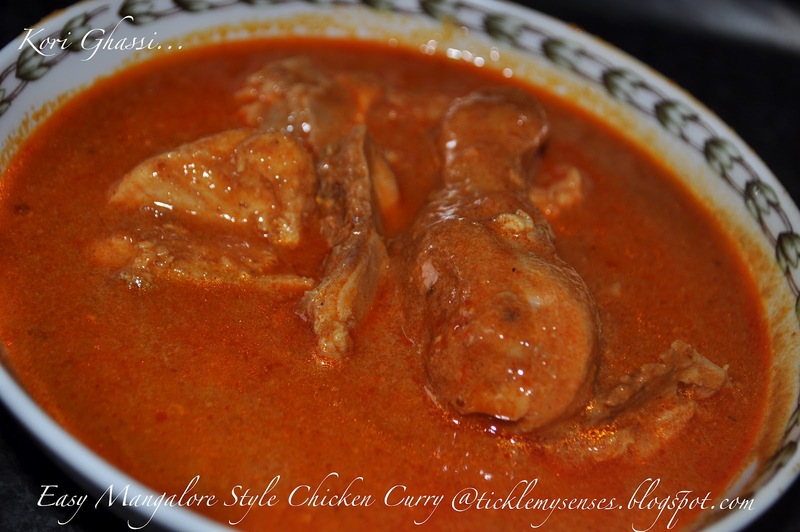 Adjust desired consistency of gravy by adding water, taste for seasoning, bring to a boil again if adding water, serve with Mangalore style roti's or boiled rice or anything you fancy. Nice to find another blog with Manglorean dishes. Will be back at leisure to explore the blog. Thank you ... and take care..
TresLeches Cake and Happy Fathers day.